Creativeworld is delighted to announce that we have partnered with Lancashire Care NHS Foundation Trust for the Quit Squad campaign. This is a fantastic opportunity to utilise our entire creative team from design to social media support and beyond! 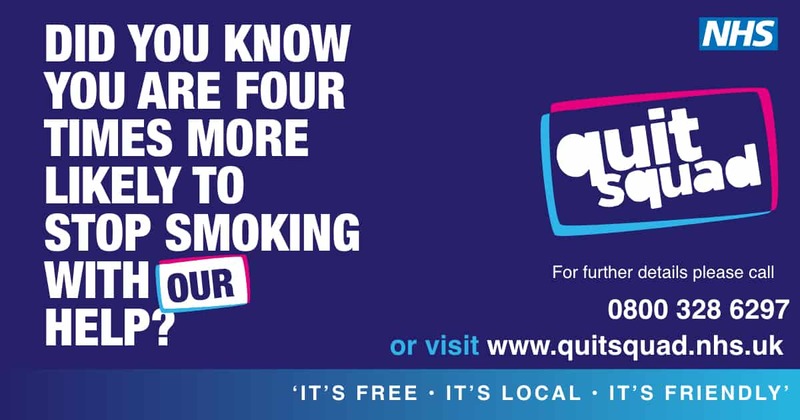 The Quit Squad is the Lancashire wide Tobacco and Nicotine Treatment Service with the aims of helping members of the public to “quit” smoking. The aim is to encourage smokers along to local sessions which take place across the county. With the help of the Quit Squad, smokers attend these support sessions, designed to help them through their journey to quit smoking. As part of the campaign, we will be looking at various case studies from the past and present all of which have their own unique story. One of our favourites being Mohammad who accidentally contacted the Quit Squad and now leads a healthy smoke-free life and encourages others to do the same. Gareth Beck Team Manager, Lancashire Tobacco & Nicotine Addiction Treatment Service (Quit Squad) told us why he chose Creativeworld. Here’s what our Health Communications specialist David Bennett had to say about the appointment. ‘This is a fantastic opportunity to make a real difference within Lancashire but also as a company, it is allowing us to really show what we are capable of. The campaign features “real” people who have benefitted from the Quit Squad support to help them improve their quality of life. We have utilised video, displays, print and social media to tell a story about quitting and about those who have and the changes that the #QuitSquad has made to their lives. We’re incredibly excited to see the story of the Quit squad unfold and most of all the impact on people’s health across Lancashire.